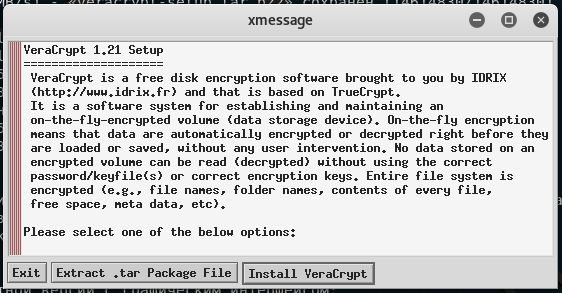 VeraCrypt is the successor of the TrueCrypt program. It is designed to encrypt disks and provides very strong security. The program is completely free, the source code is open, the author of the program regularly releases updates that not only fix errors, but also bring new functions and improvements. 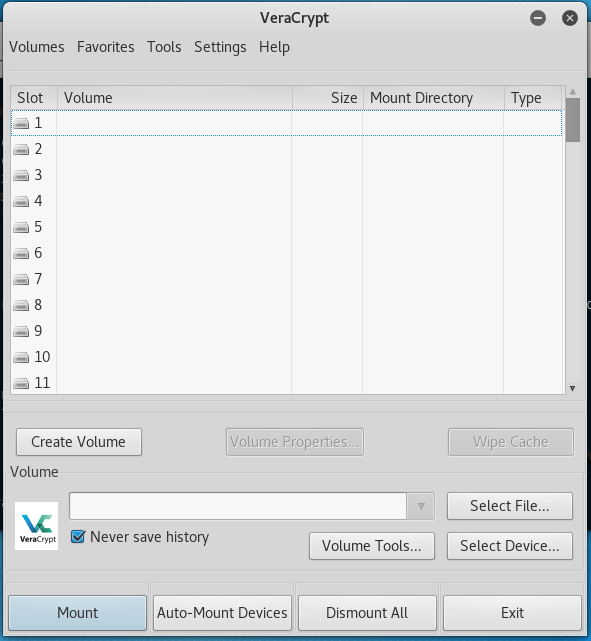 VeraCrypt is absent in the standard repositories of some popular Linux distributions. Therefore, without sufficient information, some users may occur with difficulties. This instruction describes the VeraCrypt installation process in Kali Linux, Linux Mint, Ubuntu, Arch Linux and BlackArch. By analogy, the actions described here can be used for other Linux distributions. 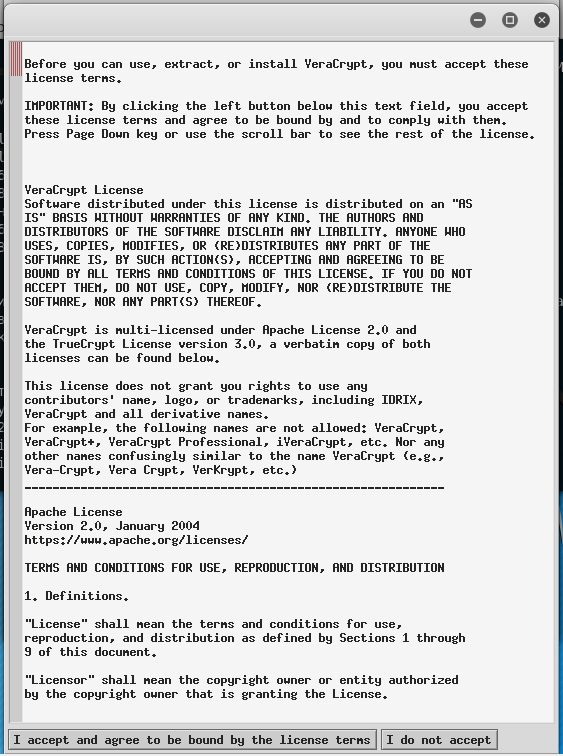 In addition to versions under Windows and Linux, there are also versions of VeraCrypt for FreeBSD and Raspbian (Raspberry Pi ARMv7). I wrote a script that simplifies installing VeraCrypt on Linux. 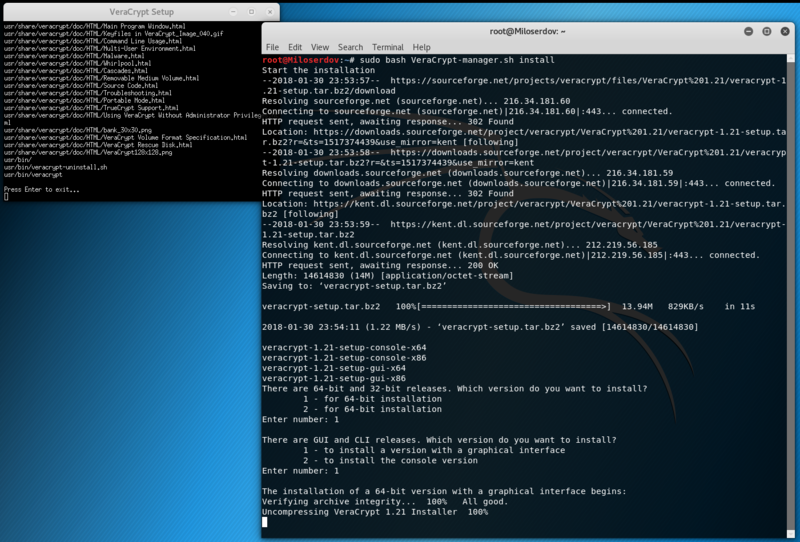 The script was successfully tested in Kali Linux, Linux Mint, Ubuntu. 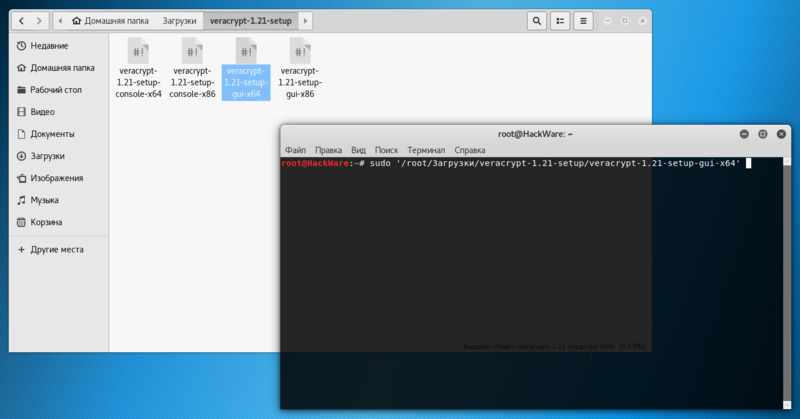 # Script for easy VeraCrypt installation in Linux. echo "There are 64-bit and 32-bit releases. Which version do you want to install?" echo -e "\t1 - for 64-bit installation"
echo -e "\t2 - for 64-bit installation"
echo "There are GUI and CLI releases. Which version do you want to install?" echo -e "\t1 - to install a version with a graphical interface"
echo -e "\t2 - to install the console version"
echo "The installation of a 64-bit version with a graphical interface begins:"
echo "The installation of a 64-bit version with a command-line interface begins:"
echo "You entered an invalid number (interface)." echo "The installation of a 32-bit version with a graphical interface begins:"
echo "The installation of the 32-bit version with the command-line interface begins:"
echo "You entered an incorrect number (bit)." echo "The latest stable release:"
echo "The version is installed on the system:"
echo "$(veracrypt --version | sed 's/VeraCrypt //')"
echo "VeraCrypt is not installed." 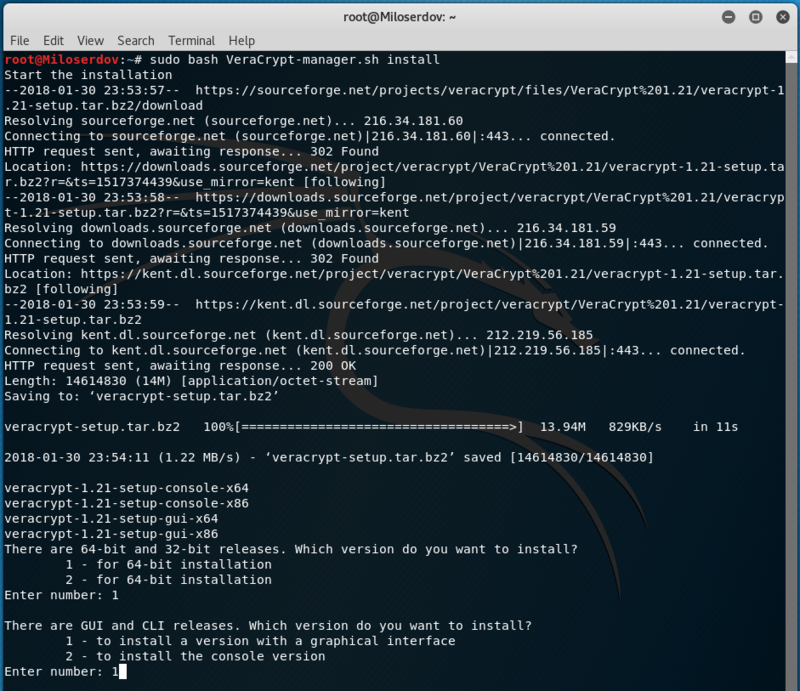 echo "sudo bash VeraCrypt-manager.sh [COMMAND]"
echo -e "\t\033[1minstall\e[0m - to install the latest VeraCrypt release"
echo -e "\t\033[1muninstall\e[0m - to uninstall VeraCrypt"
echo -e "\t\033[1mcheck\e[0m - to check the latest VeraCrypt release"
The script will determine the latest version and download it from the official site. There are 64-bit and 32-bit releases. Which version do you want to install? There are GUI and CLI releases. Which version do you want to install? With the same script you can check the current latest version, and also remove VeraCrypt. All programs, and especially concerned to security, it is extremely important to download only from official sites. 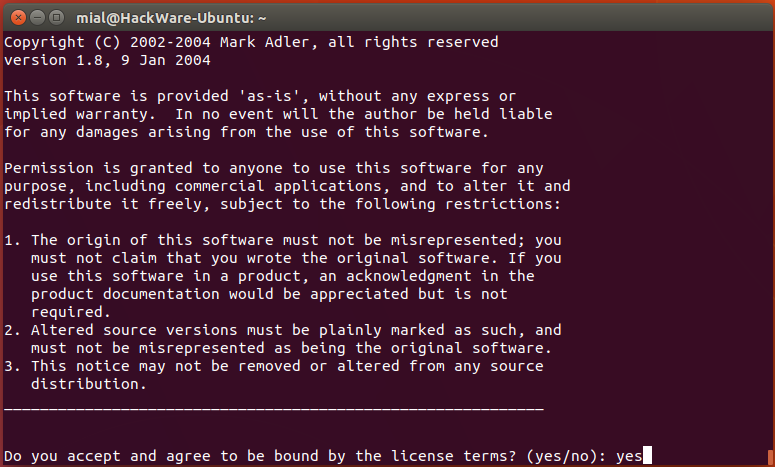 Download the version for Linux - this is a file with the extension .tar.bz2. x64 and x86 are for 64-bit and 32-bit OS respectively, gui is a graphical interface version, and console is a version with a command line interface. I.e., for example, to run the installation of a 64-bit version with a graphical interface, you need to run the veracrypt-1.21-setup-gui-x64 file. If you select the first item, the installation will be performed. If you select the second item, the archive will be extracted. Next, you need to press Enter to display the license. The license is long, you can use the Space bar to scroll it. An archive of the form veracrypt _*_ console_amd64.tar.gz or veracrypt _*_ amd64.tar.gz will be extracted to /tmp directory. 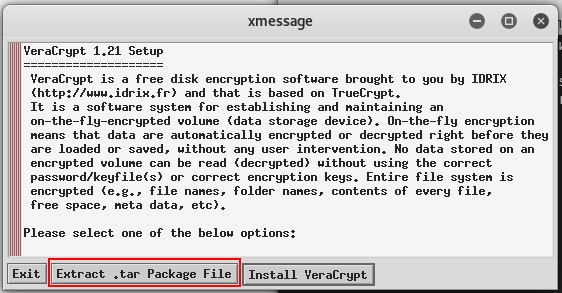 To have VeraCrypt with different interfaces in you system, you can install one version as a normal program, and you can use the second version as a portable one. Either use both versions as portable.